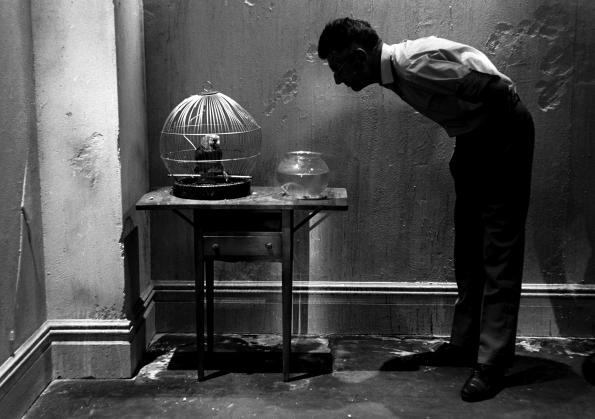 Samuel Beckett Died on 22 December 1989. Samuel Beckett discusses forms with Harold Pinter. Poet John Montague, a close friend of his fellow Irishman in Paris in the 1950s and 60s, tells me that Beckett, who was ill at ease with people he didn’t know well, would sit in a cafe moving the objects on the table around, “playing a fantasy game of chess”, as Montague puts it. It is also tempting to see Beckett treating the stage like a chessboard. Endgame in particular is, as the title makes clear, infused with chess. As always with Beckett, there is no easy key to understanding. Chess is clearly a subtext of Endgame – his biographer Deirdre Bair says Beckett was clear on this point – but it is difficult to be reductive. “Ever tried. Ever failed. No matter. Try again. Fail again. Fail better.” Samuel Beckett quote tatooed on Stan Wawrinka’s arm. To Samuel Beckett archive here. 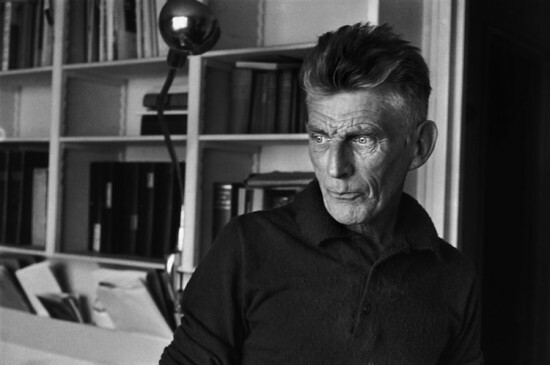 Samuel Beckett died on Dec 22, 1989. 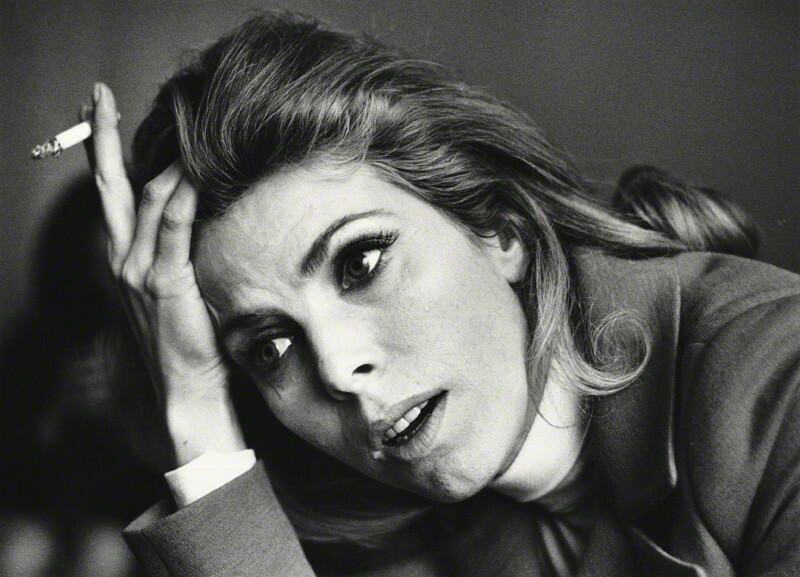 In her autobiography Billie Whitelaw… Who He?, however, she acknowledged it was her work with Beckett that generated the most interest. 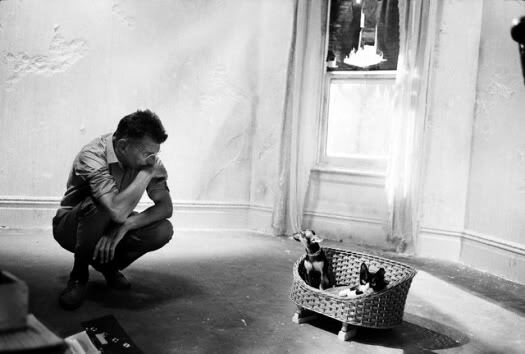 Beckett was consistent in his loneliness. The unhappy boy soon grew into an unhappy young man, often so depressed that he stayed in bed until mid afternoon. He was difficult to engage in any lengthy conversation–it took hours and lots of drinks to warm him up–but the women could not resist him. The lonely young poet, however, would not allow anyone to penetrate his solitude. 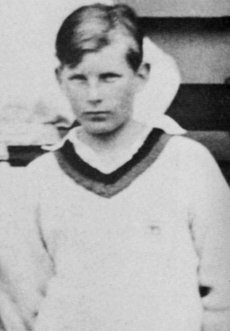 He once remarked, after rejecting advances from James Joyce’s daughter, that he was dead and had no feelings that were human. Barney Rossett was his publisher and ex husband of Joan Mitchell. 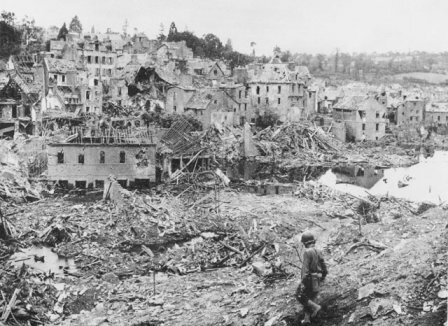 Beckett might have sat out World War II in his native Ireland, but as he later quipped in an interview with Israel Shenker, “I preferred France in war to Ireland at peace.” By 1941 he had joined the Resistance in Paris, largely as a response to the arrest of such Jewish literary friends as his old Trinity College classmate Alfred Péron. As a neutral Irishman who spoke fluent French, Beckett was in great demand; he and his companion (later wife) Suzanne Deschevaux-Dumesnil joined Gloria, a reseau de renseignement or information network, whose main—and dangerous—job was to translate documents about Axis troop movements and relay them to Allied headquarters in London. 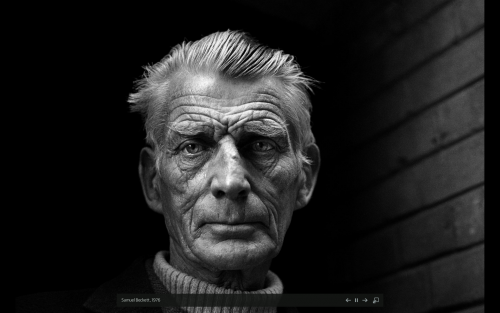 Waiting for Beckett: A Portrait of Samuel Beckett is a must for anyone interested in his work. It traces Beckett’s early years in Ireland and Paris, before discussing the impact of his novels, plays and late work with the help of friends, scholars and publishers. What ‘Molloy’ reveals is not simply reality but reality in its pure state: the most meager and inevitable of realities, that fundamental reality continually soliciting us, but from which a certain terror always pulls us back. . . . There is in this reality the essence or residue of being. . .
Faces from left, Anna Akhmatova, Meryl Streep, Patricia Clarkson and Simone Weil. We have the actresses to portray Anna Akhmatova and Simone Weil. Would anyone care to write scripts for these talented actresses? II – Ohio Impromptu – Jeremy Iron in Samuel Beckett Play. There are two characters, the Reader and the Listener. The Reader, it emerges, is a mysterious messenger from someone now dead and once loved by the Listener. The book the Reader reads from tells the story of the Listener mourning right up until the last moment, when the story is told for the last time and “there is nothing left to tell.” Throughout, the Listener not only listens but also regulates his companion’s reading by knocking on the table with his hand in an attempt to ensure that this will not be the final telling of the tale. As in Dead Ringers, Irons does a remarkable job at portraying dual natures without the need for makeup or gimmickry: you always know which is which, as if Irons has inhabited both roles from birth to present, experiencing every nuance of difference over the years and inscribing them into face, voice, posture, manner. His Listener is deeply tragic but never pathetic; lost in a barren desert of his own creation, his final, angry knock is a note struck with overtones of futile desperation and fateful resignation. His Reader is no less remarkable. Like someone trusted with the care of a terminally ill but occasionally demanding loved one, he balances tender pity with profound weariness, painfully restricted compassion with self-aware frustration. When Reader and Listener trade knowing looks, you completely forget this is the same actor. 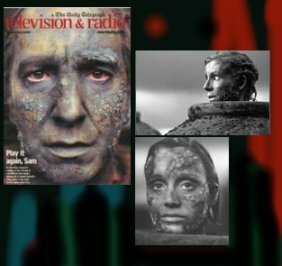 Alan Rickman, Kristin Scott Thomas and Juliet Stevenson playing (tongue twisting Beckett play directed by Anthony Minghella) now on Youtube. You only discover Beckett’s genius once you start immersing yourself in the material. Beckett completely altered our vision of what theatre can do. In a sense they are not really plays but theatrical events. He is more a poet or installation artist, or performance artist, or some strange combination of all of those things, than a playwright. He pays as much attention to what sound and light are doing as he does to text. Stevenson on Play. 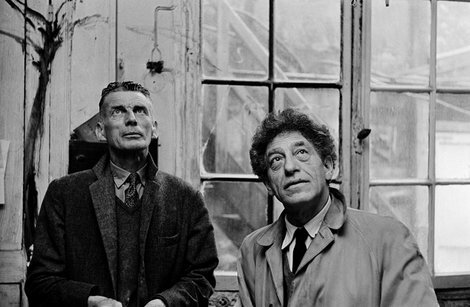 In 1965 Philip Glass composed music for a production of Play. The piece was scored for two soprano saxophones, and is his first work in a minimalist idiom – an idiom which was substantially influenced by the work of Beckett. From here. Beckett’s work can lay a strong claim to universality: not everyone has a God, but who doesn’t have a Godot? 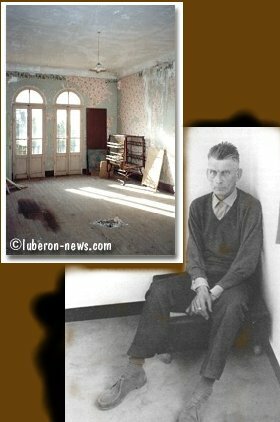 The photo above is a room preserved as is from Beckett’s residence in Roussillon. Javier Marias used the photo of Samuel Beckett shown on the bottom right to describe him in his book “Written Lives”. 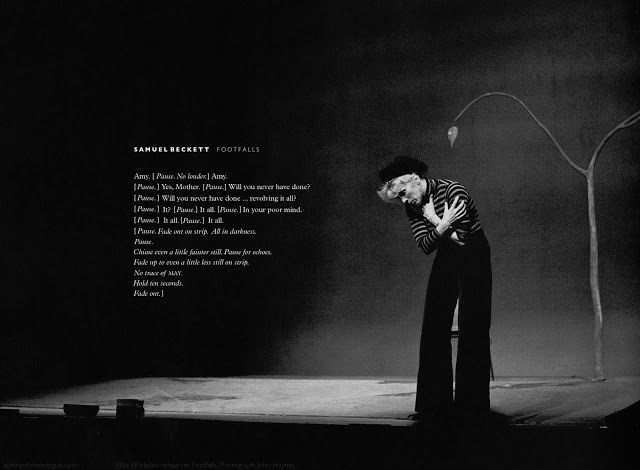 He wrote about Mayakovsky and his remarkable shoes before moving forward to his impression of Beckett’s photo. 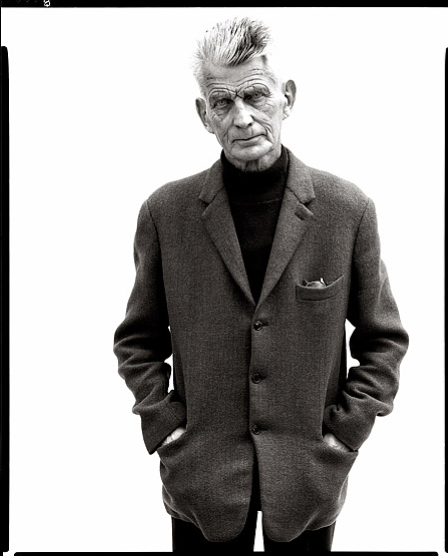 Beckett was asked by a reporter how a small country like Ireland could have produced so many great writers since the last half of the nineteenth century. 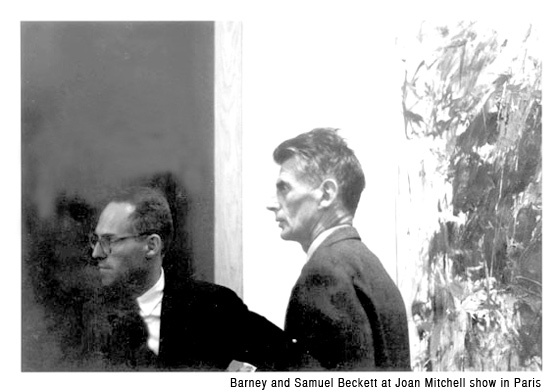 Samuel Beckett was a close friend of Joan Mitchell and her husband Barney Rossett was Beckett’s publisher. Beckett at 100 from Greencine daily with many good links including one on Barney Rossett. 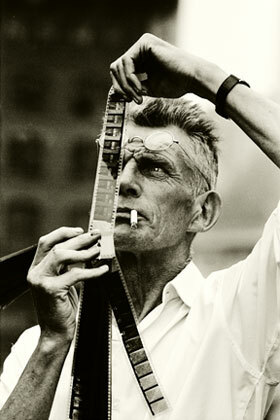 Samuel Beckett was born 100 years ago on April 13, 1906. His sun is in Aries and his moon is in Sagittarius, the same combo as Vincent Van Gogh and Thomas Jefferson with whom he shares a birthday.